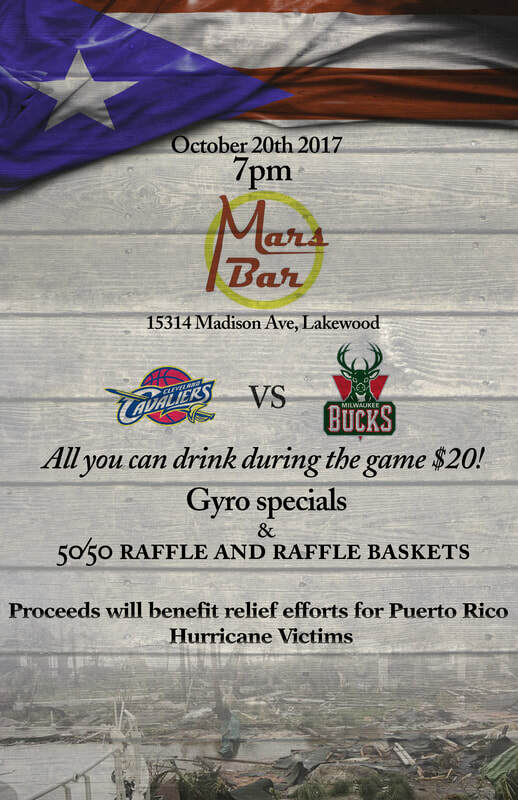 A special thanks to the people at Mars Bar in Lakewood, Ohio for hosting the above fundraiser on October 20th, during the Cleveland Cavs' game. Proceeds from this event went to Cleveland4PuertoRico www.clev4pr.org to support the ongoing relief and rebuilding efforts in Puerto Rico. On September 20, 2017 a devastating hurricane struck the beautiful island of Puerto Rico. “By the record books, it was the fifth-strongest storm ever to hit the US. At least 10 people died in the storm”, the New York Times reports. Communications to and from Puerto Rico are strained, and the situation on the ground sounds very grim. There is no electricity on the entire island and it could remain that way for months. Whole communities are likely destroyed and it's probable the island saw near-record levels of rain and flooding. The Hispanic Police Officers' Association's board, instantly began contacting various local agencies in order to establish a well organize relief effort. After various discussions and due diligence, we decided to assist the "San Lorenzo Club", located at 3121 West 33rd Street, with the collection of tangible donations. Further, we established our own PayPal account for those interested in making a monetary donation. All of our monetary donations will be used directly for the purchase of additional donations needed or to assist with the shipment cost associated with sending the collected donations. We thank you in advance for your gracious support and our thoughts and prayers will continue throughout this difficult time.